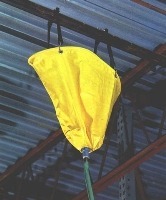 Ultra-Pipe Drip Diverter Keeps Fluid Leaks Off The Floor-Eliminate Slip Hazards And Chemical Exposure. Large 18″ Diameter Opening Captures Overhead Leaks, Big And Small. Bottom Fitting Connects To A Standard Garden Hose, Allows Fluids To Be Collected In A Drum Or Tank. Rugged, Coated Vinyl Construction-Ships Complete With Bungee Cords And Hooks For Quick Installation. 18″ Dia. X 18″ Ht.